John Monash's connection to North and West Melbourne did not end with his early childhood in Dudley Street. In 1887 what would become a lifelong interest in military affairs saw him join the North Melbourne Battery of the Metropolitan Brigade of the Garrison Artillery, whose task was to defend Victorian ports from unauthorized encroachments. Here he developed his engineer's interest in artillery. His background in the university militia gave him the rank of lieutenant. Monash's obituary in The Argus of 9 October 1931 records that he was promoted captain in 1892, major in 1900, lieutenant colonel in 1905 and colonel in 1912. Federation created an Australian Citizen Force Army, to which Monash transferred. He commanded the Australian Intelligence Corps from 1908. until March 1914. In that role he cultivated interests in military mapping, tactics and military history. He was still a colonel when war was declared in August 1914. His first engagement was at Gallipoli, where, promoted to brigadier general, he had a mixed and rapid education in poorly planned warfare. Interestingly, his biographer, Geoffrey Serle, notes that "wild rumours were circulating in Cairo, London and Melbourne that he had been shot as a German spy and traitor; [which echoed] a similar vicious whispering campaign in Melbourne the previous October. The Great War, as it was later known, would put him among the nation's heroes ever after. Once described as "the militia colonel", Monash "was destined to teach the generals of the world how to wage war", wrote The Argus. "When the occasion arose he showed that he spy and traitor; [which echoed] a similar vicious whispering campaign in Melbourne the previous October". The Great War, as it was later known, would put him among the nation's heroes ever after. Once described as "the militia colonel", Monash "was destined to teach the generals of the world how to wage war", wrote The Argus. "When the occasion arose he showed that he was pre-eminently a soldier, and that he had brain power and organising ability scarcely surpassed by that of any of the great soldiers who took part in the war." Geoffrey Serle describes the role of the Australian Imperial Force (AIF) under Monash in the final months of the war as "glorious" when it led "a series of victories unsurpassed in the annals of the British army for the remarkably light cost ... according to military historians ... of 5000 AIF dead". Whether or not the hyperbole is justifiable, the Argus obituarist has singled out the quality that most distinguished Monash's military career: meticulous and aggressive planning. (In France he had become a major general commanding the 3rd Division of the AIF.) He was highly confident of his own judgment and gifted with the methodical planning skills of a professional engineer, but on top of that he was convinced that the Allies' tactics in grim trench warfare were too timid and led to pointless sacrifice of lives. Monash was devoted to his men and they to him. He believed they fought best when they had a clear purpose and hope of victory. As far as possible he explained his tactics to his officers and ultimately to his troops. This gift for leadership was often commented on and notably admired by the British Commander-in-Chief, Earl Haig — and it was no small matter to thus praise a colonial of German-Jewish origins. Monash's regard for his troops continued into the postwar years. He was the principal spokesman for returned servicemen, led the Anzac Day march and was a key figure in setting up Melbourne's grandiose Shrine of Remembrance. His early years postwar were scarred by the death of his wife in February 1920. He briefly returned to old interests as director of a reinforced-concrete company but in June of that year jumped at the offer to establish and run the State Electricity Commission of Victoria. Before the end of the decade Monash's engineering and managerial genius had resolved the problems of generating from brown coal and established a statewide grid. The grid we still have but distribution has unhappily passed into the never-never of privatisation. One day brown coal will have to give way to renewable energies, as Monash would undoubtedly urge were he alive now. Despite his state responsibilities and the huge efforts he put into the causes of returned soldiers, Monash seemed to have unending time for numerous offices, including vice-chancellor of Melbourne University, president of the Australasian Association for the Advancement of Science, national 'President of the Australian Zionist Federation, and founding member and second president (in 1922-23) of Melbourne Rotary. 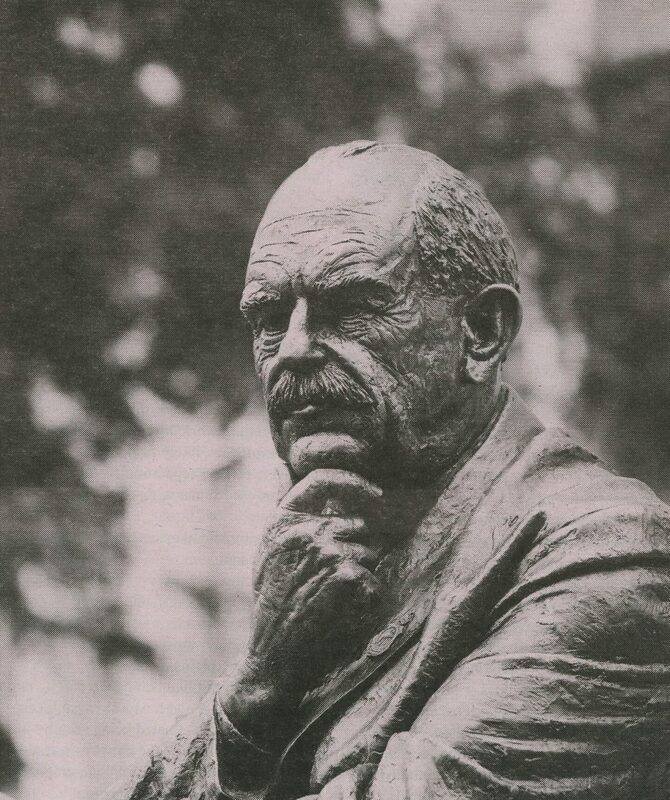 This last connection was the reason that Melbourne Rotary decided to fund a statue of Monash at the university named for him. By a nice coincidence the current president (the 99th) of Melbourne Rotary, Peter Rogers, is a North Melbourne resident. The project was clearly appropriate in the present year of remembrance of Gallipoli and the Western Front. An engineer himself, Peter is keen to have Monash remembered as much more than a soldier, great general though he was. In outlining the many valuable community projects of Rotary today, Peter reminded his audience that all their projects honour "John Monash's Specific Objects of Rotary, published in The Argus of 29 April 1922: to encourage and foster high ethical standards in business and the professions; and the ideal of service as the basis of all worthy enterprises”. by Bill Hannan - member of the Hotham History Project, September 2015.